Get ready to celebrate with this free champagne toast embroidery pattern! A design like this is perfect for New Year's, weddings or anytime you want to offer a celebration cheer in stitching form. 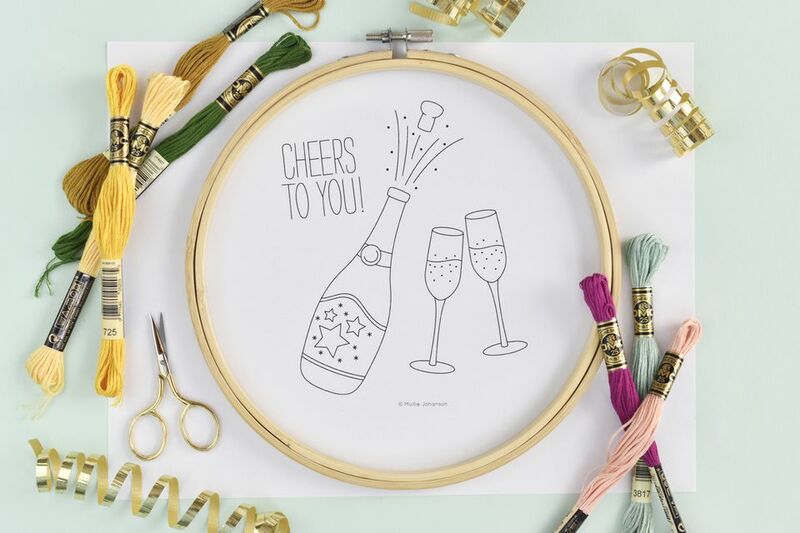 Embroider the "Cheers to You" design and frame it in a hoop as a gift or make it into a pillow or a tablecloth for decor that comes out at special celebration times. The pattern fits well within an 8-inch hoop and you only need to know a few simple stitches to create your own champagne or sparkling cider embroidery. Of course, the three elements of the pattern can be used separately as well. Gather your favorite embroidery supplies and get this stitching party started! This pattern is a JPG file that you can download and print using most photo and imaging software. Before you print the pattern, scale it to the size you want. Print in landscape/horizontal mode with the scale set to "fill page" for a pattern that fits nicely within an 8-inch embroidery hoop. This design can be enlarged or reduced for various uses, although reducing too much may make some details difficult to stitch. After printing, use your favorite transfer method to mark the pattern on your fabric. Although the design works together, you don't have to use the entire pattern at once. For example, you might leave off the words or only use the glasses. Place the marked fabric in an embroidery hoop. If you find that the fabric slips in your hoop or if you plan on working on this over time, try using a wrapped hoop, which helps hold the fabric tension without as much misshaping. You can work with any colors you like for this project. For the colors shown above, use DMC 904, 680, 725, 3855, 3817, 353 and 917. If you want to use another brand of embroidery floss, use a conversion chart to find exactly what you need. For a bit of extra sparkle, consider using metallic thread in place of the dark yellow thread or adding some blending filament to the champagne. Depending on the size you work this pattern, you can use anywhere from 3 to 6 strands throughout the design. Keep the number of strands consistent, except for the french knot bubbles. Use stem stitch for the outline of the bottle and the glasses. Work the words, spray of champagne, and the bottle label with back stitch. Use star stitch for the tiny stars on the label. For the bubbles, use 6 strands of floss to make the french knots in the spray of the bottle. Use 3 strands for the french knot bubbles in the glasses. This change in strands alters the size of the knots. Another way to do this is to wrap the french knots more or fewer times, but using a different number of strands is the more traditional way to do this.